Our new issue is out now. Subscribe today! How liberals brought an anticommunist slur from America’s past back to life. 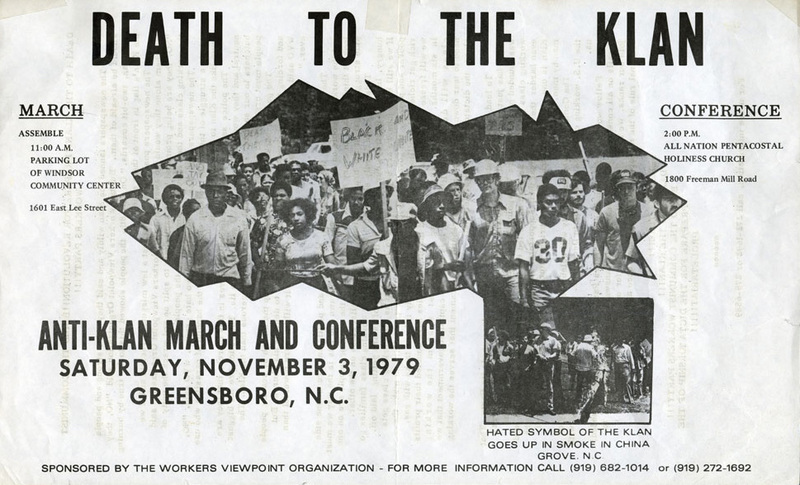 A 1979 Communist Workers’ Party-led rally against the KKK that would culminate in the Greensboro massacre. Our new issue, on what a President Bernie Sanders could actually do in office, is out now. Subscribe today to receive it! Bull Connor referred to Martin Luther King Jr as one, even though his church was in the state capital, Montgomery. These two words were also uttered by Thomas Jackson, the police chief in Ferguson, as he tried to describe why his mostly-white police force could not stop the protests occurring in the nearly 70 percent black city he was charged with patrolling. All of these men were segregationists, anticommunists, and purveyors of state-sanctioned violence against African Americans. But now you can also find some prominent liberals using the term, ostensibly in relation to the activities of small pockets of anarchists and the Revolutionary Communist Party in the city. And while police have rightfully been criticized for their heavy-handed approach to the protests that have gone on since Brown’s death, the intelligence they’ve gathered regarding some of the more riotous protesters has been correct. Those who wish to do physical harm to law enforcement are small in number, and subversive in tactics. Yesterday, Richard Seymour asked what it means that these liberals, “unthinkingly regurgitate the stuff about ‘outside agitators’ in Missouri.” I think I can answer that. It is not the RCP that these liberals are scared of. Only a fool would believe that eight to ten sectarians from Hyde Park have the power to tank a demonstration as large as the ones occurring in Ferguson. But these empty protestations from liberals do have a very clear purpose: separating people of color from a spirit of revolutionary community-building and anticapitalist politics. One important aspect of boldly spreading revolution and communism everywhere is the work of building what we have characterized as a culture of appreciation, promotion, and popularization around the leadership, the body of work and the method and approach of Bob Avakian. If that’s not weird enough for you, then try this blog post about the RCP’s Burning Man dedication to Avakian. Most socialists and communists do but one thing to the RCP in general: ignore them. But then there’s the case of Carl Dix, a member of the RCP who was arrested in Ferguson on Tuesday. Dix is from an older generation of black activists, one who’s chosen to fight for communities of color through sectarian anticapitalist organizations. As many radicals know, it is a tradition common in older cities like New York, Philadelphia, Baltimore, and Chicago with both large black populations and strong socialist and communist histories. But not surprisingly, it is a history completely alien to many mainstream liberals today. And while we might wonder what it is about the RCP specifically that Dix finds worthy of his time, no one can deny his dedication to the kinds of working class issues that disproportionately affect blacks — issues that liberals and the Democratic Party either avoid or exacerbate — whether it’s helping to lead the fight against stop-and-frisk in New York or his work in New Orleans trying to save public housing from demolition. 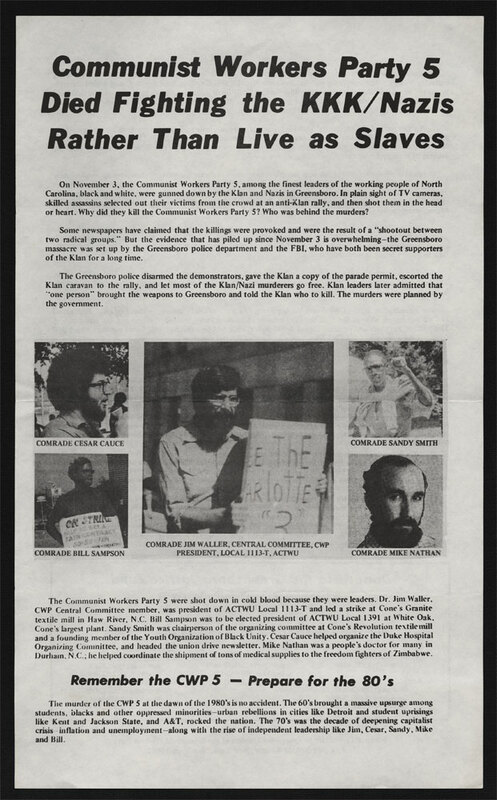 It says something, though, that the idea of “communists” advocating “revolution” while taking part in a protest in a predominantly black community elicits such disgust and bewilderment from even sympathetic observers. They feel so comfortable erasing black socialists and communists from the history of freedom movements in America that one could be forgiven for thinking that they do not know they even existed — staunch anticapitalists like Bayard Rustin (March on Washington planner), Harry Haywood (a member of both the US and USSR Communist Parties who worked on the Scottsboro Boys case), and, of course, Dr Martin Luther King Jr, a socialist. According to a website called the Missouri Torch, the man French is referring to is one Greg “Joey” Johnson, of Chicago. They have a variety of other images and videos of Johnson and assorted ‘commie’ — their word — friends being shown around Ferguson. It’s pretty plain they’ve identified him correctly. The Missouri Torch, approvingly cited by Dean, is a site that has referred to Michael Brown as a “thug” and sought to justify his murder by Ferguson Police. The RCP has, apparently, also turned liberals into defenders of white supremacy. At the very least, these liberals are no different from the white moderate described by King in his “Letter From a Birmingham Jail.” They prefer a false peace to a just peace; they prefer orderly hand-holding and singing from communities that have been brutalized beyond belief; they prefer a quiet list of demands read out at a press conference, as if that has not already been tried before to little effect; they prefer to focus on the empty (or absent) proclamations of their favorite celebrity punching bags rather than focusing on the lives and humanity of real people who are fighting white supremacy and repression on the ground right now. But in reality, these liberals are the enemies of the sort of radical change that these terms of inclusiveness are meant to signify. The language is turned into tools to silence and freeze people out of meaningful discussions about coalition-building and community change and, ultimately, reinforce capitalism’s status quo. The ease with which certain liberal bloggers at venues like the Daily Beast and Gawker use the terminology of racists, bigots, and violent segregationists should give everyone pause, and it should tell leftists that we have a long way to go towards building a truly progressive media. In every American community there are varying shades of political opinion. One of the shadiest of these is the liberals. An outspoken group on many subjects, ten degrees to the left of center in good times, ten degrees to the right of center if it affects them personally. Here, then, is a lesson in safe logic. Ferguson has been a lesson in “safe logic.” But what will we learn? Douglas Williams is a PhD student in political science at the University of Alabama, researching the labor movement and labor policy. He blogs at The South Lawn . Thanks, Harvard. But We’ll Take What’s Ours. Catalyst, a new journal published by Jacobin, is out now.